Chris Maule: Marty Peters was just here. Alma: Marty Peters? The man who shot the last blacksmith? Chris Maule: He... he... he did what? Alma: Well, it's all based on circumstantial evidence. No one actually saw the bullet leave the gun. 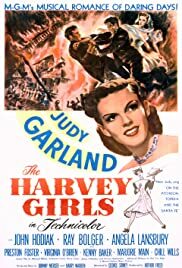 The Harvey Girls, a film to celebrate the first of the fast food chains which quite frankly would be what the Harvey Restaurant chain was back in the modernizing west. There are folks in the town who don't want to see the Harvey Restaurant established and thereby hangs the tale of this film. Preston Foster is the town boss and John Hodiak runs the saloon. These guys thrive on the town being in the Wild West accent on the wild. Foster's a rather shrewd villain, he realizes that the clean cut virginal Harvey girls who are servers might make the men forget the loose women of the saloon and that if they court and marry them and start raising families, they might demand a little law and order. That would be a disaster for Foster. Better to cut the problem off at the root. Hodiak however is a jaded sort and bored with the loose women of his establishment. In a cinema not under the Code influence, Angela Lansbury and her crew would be prostitutes. He kind of likes the idea of the Harvey Restaurant coming to town and likes it better when Judy Garland comes to town. 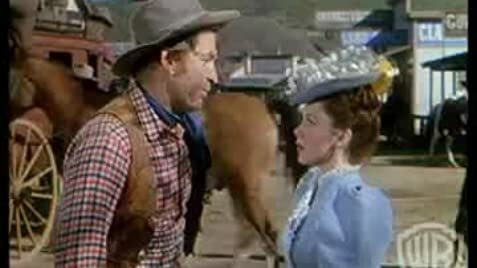 Judy's come to town as a mail order bride, but when she sees Chill Wills is the prospective groom, both of them decide they're not suited for each other. Hodiak has been writing Wills's letters, a plot device that was used in the Joseph Cotten-Jennifer Jones film Love Letters. If you know about that film, you know how The Harvey Girls turns out. The Harvey Girls has come down in cinema history because of the famous On The Atchison, Topeka, And The Santa Fe number. The song itself won an Academy Award in 1946 for best original song and the number as staged by MGM is one of the longest and most complex in the annals of film. It runs about 20 minutes and just about every member of the cast except Hodiak and Foster get a line or two in the song. Of course it ends with Judy as well it should have. One thing I don't understand though is the under use of both Ray Bolger and Kenny Baker. Bolger of course had co-starred with Judy in The Wizard Of Oz, but he was far more known for being a Broadway star than a film player. 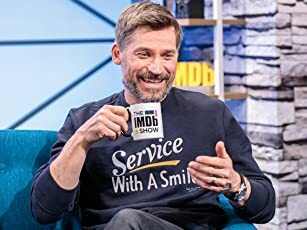 He had just come off a big run in the last Rodgers&Hart musical By Jupiter. Kenny Baker was a famous radio singer who also had starred on Broadway in Kurt Weill's One Touch Of Venus with Mary Martin. Why these guys got the supporting roles they did is a mystery to me. I suspect both of them had a lot of their parts end up on the cutting room floor. MGM editing mastery was at its best in The Harvey Girls. The film was partially done on location and partially done at Culver City. The editing is so smooth you really can't tell. Harry Warren and Johnny Mercer wrote the score for The Harvey Girls and while the Atchison number dwarfs the rest, there's a song called It's A Great Big World that gets sadly neglected. It was sung by Judy Garland, Virginia O'Brien, and someone dubbing Cyd Charisse who first got noticed in this film for her dancing. As I said before if done today if some gazillionaire would finance a remake, Angela and her saloon girls would be portrayed more frankly as working girls. But that would also cause the film to lose some of its naive charm. And this film holds up quite well for 63 years and counting.